We all use baseball for different things. For some of us it’s a job, others it’s pleasure, fandom, or publicity, but for a certain few it’s a way to forget what is going on in the real world, even if it’s just for 9 innings. You can flip on the TV, turn on the radio, or go to the ballpark and sit in the bleachers, and completely forget that there is a world just outside the friendly confines that you’ll inevitably have to go back to. But just for those 9 innings you can forget everything except what is going on in front of you. The Camp Fire, which was named after Camp Creek Road in Butte County, broke out on November 8th, 2018. The county of Butte is just 90 miles north of the capital of California, Sacramento. “It was warm and the sky was really dark orange in color,” Keith explained. The day the Camp Fire started it grew nearly 20,000 acres because of the warm, dry weather and Jarbo winds, which are strong winds that come from the east of Butte. 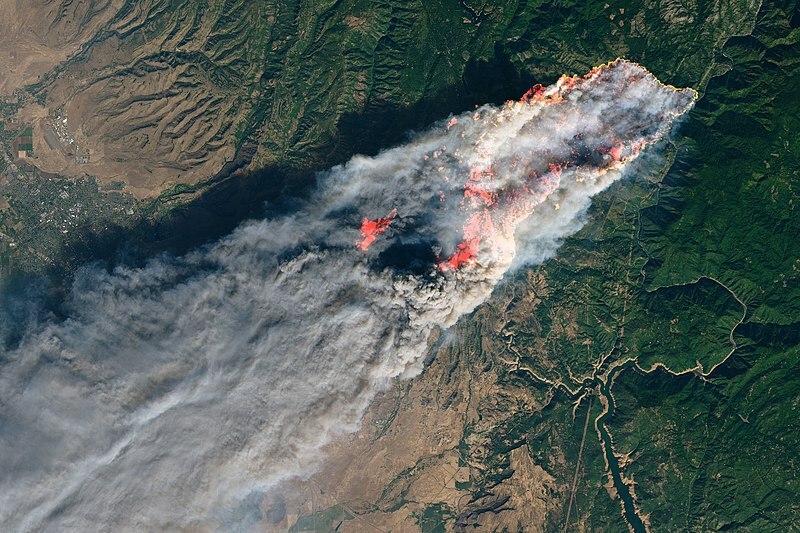 After all was said and done, the Camp Fire would burn 153,336 acres, almost 240 square miles, and took 85 lives over the two and a half weeks it burned. It destroyed 18,804 structures, and caused upwards of $16.5 billion in damage. It took the most lives and destroyed the most structures for a wild fire in California state history. Keith grew up just a few miles from Angel Stadium, in nearby Westminster until he was 12, when he and his family moved to Paradise. “My favorite player growing up had to be Vladimir Guerrero. He was just so fun to watch and made every game exciting.” Now Keith explains that, “My favorite player now to watch is obviously Mike Trout. He’s one of the best baseball players to play the game and just seeing the love and passion he has for the game is incredible.” He credits his fandom of Angels baseball and getting into baseball in general to his grandfather, who was a huge fan of the Halos as well. Though him and his grandfather didn’t go to a lot of games, Keith remembers sitting in the garage listening to the games on the radio as grandfather would work on projects. Joriel had grown up just north of Sacramento, in the small town called Oroville, which is well known for the Oroville Dam. She had just moved to Paradise no more than a year before the devastating fire. 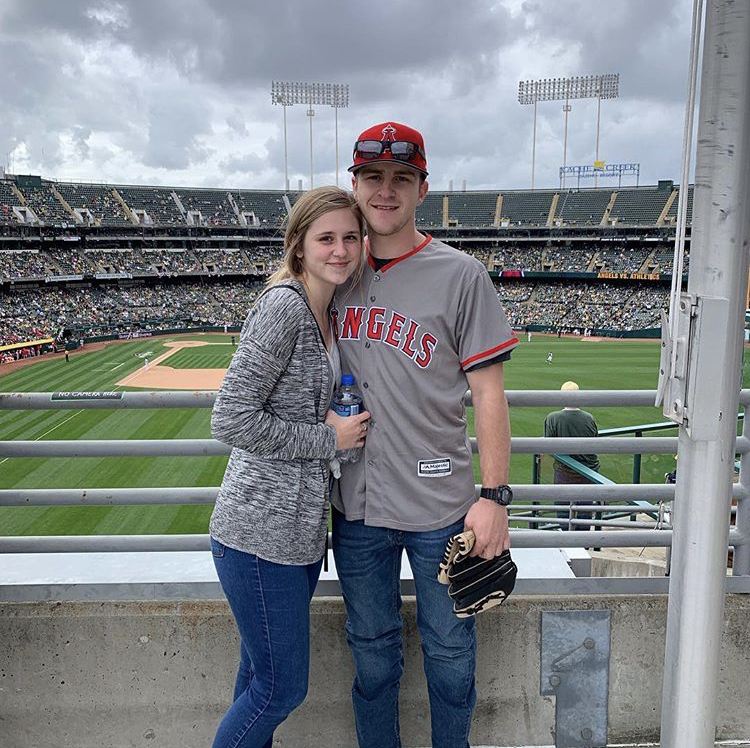 Baseball has always been a part of her life, and whenever her and Keith see the Angels on the schedule to play the Oakland A’s they try to make the nearly 3 hour drive to see the Halos play. Since the fire, Keith and Joriel, alongside Keith’s brother and his girlfriend, have bought a house in Chico, California, which is less than 20 miles away from the city of Paradise. 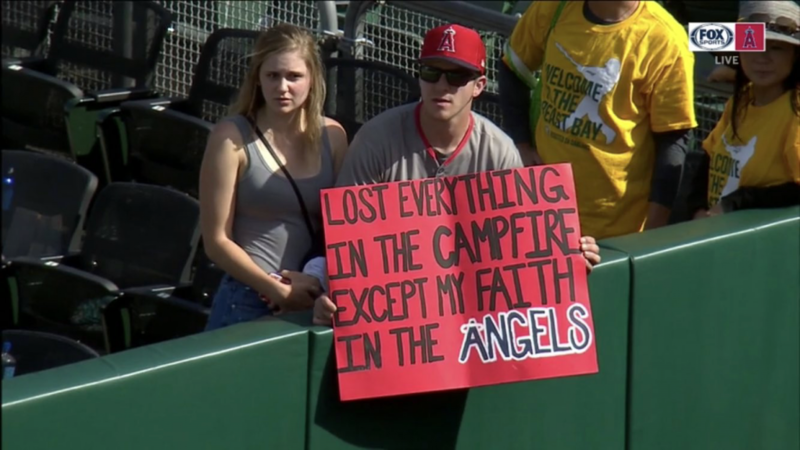 The amount of support in the Angels Baseball community was also great since they made the sign. Multiple fans, along with Angels VP of Communications Tim Mead and play-by-play announcer Jose Mota all got in contact with Keith and Joriel about ways that they could help out. You can follow Keith and Joriel on twitter @ChiefKeith522, and @Jorieleep.